That all-powerful, magnetic pull that occurs when you find yourself suddenly and irresistibly attracted to another can come at any moment and there’s nothing you can do about it. In the absorbing new Todd Haynes directed drama Carol you see it the moment it happens. Rooney Mara plays aspiring young photographer Therese Belivet working in the toy department of an upscale New York City department store. It’s the early 50’s, plus it’s fast approaching Christmas; the shopping season is in full swing. While attending to customers, Therese glances up and suddenly notices across the room an older, somewhat glamorous woman looking back, and that’s the moment. “Shopping makes me nervous,” the older woman remarks at the counter. “Working here makes me nervous,” the younger woman replies. After that short, conversational exchange where Therese follows with advice on a certain model train set as a gift, the older woman in the expensive fur coat, Carol Aird (Cate Blanchett) exits, but accidentally leaves behind her gloves on the counter. Both women lead very different lives. Therese has a boyfriend who wants to marry her while Carol is going through a difficult divorce, complicated further because of a young a daughter caught in the middle. 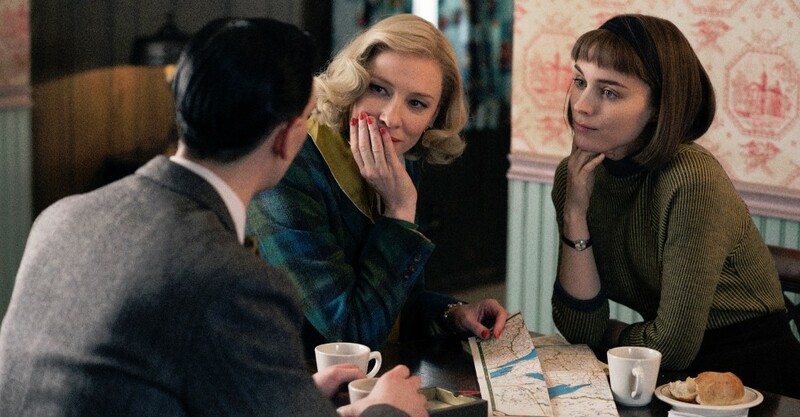 When Therese goes out of her way to return Carol’s gloves, the older woman invites the younger woman to lunch. Though both are careful and, to a degree, guarded on what they do and say, it’s clear that an attraction has formed. But this is the 1950s, a time when an attraction of this nature is unheard of by a repressive society that could hardly acknowledge that such a love even existed. To Carol and Therese, what they have developing between them is suddenly their world; to everyone else, what the women have, expressed mostly through lengthy glances and the occasional touch of the hand on a shoulder, is invisible, and if recognized would not be tolerated. When author Patricia Highsmith first published her popular 1952 romance novel The Price of Salt, she did it under the pseudonym Claire Morgan. The book’s lesbian content was unusual for the period because of the moderately hopeful ending – there was no 50’s moralistic punishing conclusion for the gay characters – and that repressive society in which her characters lived was the same one reading Highsmith’s work. It was later, on subsequent publications that the author’s real name was used, plus the title of the book was changed to Carol. With just slight changes in character – in the book Therese is not a photographer but a theatre set designer, plus it’s a Christmas card the younger woman sends to Carol, not her gloves – the arc is the same. With its somewhat grainy though eye-catchingly brown-stained look, Edward Lachman’s 16mm cinematography nicely captures the required visual flavor of 50s cinema. 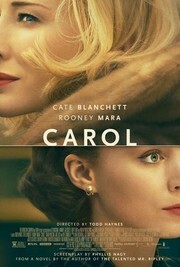 Absent of the clinically clean and sharp clarity of digital, Carol actually looks like you’re watching film. It’s a haunting experience, one made all the more engrossing by its lack of need for dialog. 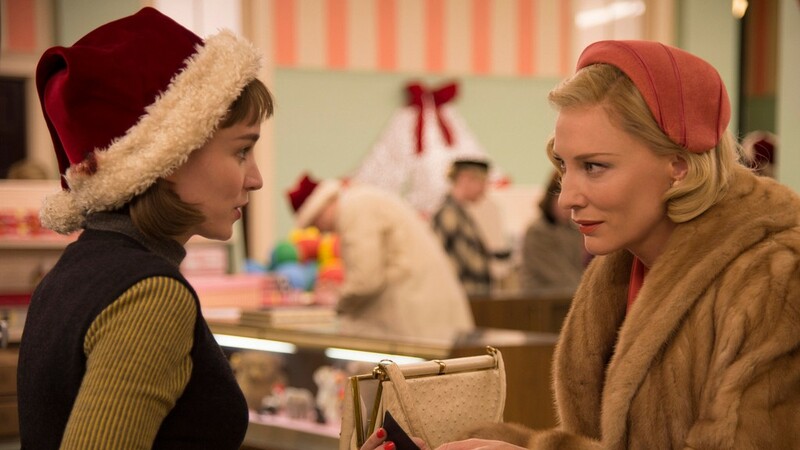 Watching Therese and Carol watch each other can be as compelling as experiencing any atmospheric mystery. Before writing The Price of Salt, Highsmith’s first novel was the psychological thriller that became a 1951 Alfred Hitchcock film, Strangers on a Train. There’s a similar feel to the emotional construct of Carol, heightened by the moment when Therese discovers a gun hidden in Carol’s suitcase, packed away before the women take a trip together to Utah. Both Blanchett and Mara craft their characters with flawless precision, supported further by two short though equally solid performances from both Sarah Paulson as Abby, the friend with whom Carol once had a forbidden tryst, and Kyle Chandler as Harge, the husband who claims he loves his wife but treats her with neglect, one born of an earlier generational sense of societal male superiority. When Harge goes looking for his absent wife, he knocks on Abby’s door. The woman has no sympathy for the husband and spells things out. “You’ve spent ten years making sure her only point of reference is you, your friends, your job.” With an economy of words, Abby has underlined not only Harge’s issue but the issue that haunted many relationships of the day; it echoes how unbalanced things used to be, and, to a degree for some, remains still today. The story is framed by the same scene: Two women sit at a table in private conversation. They’re interrupted when an approaching man recognizes the younger of the two. The women politely part, but at the moment of goodbye, the older woman places a gentle hand on the younger woman’s shoulder. It appears innocent enough, but the younger woman’s glance down at the hand indicates something considerably more intimate. The film will circle back to that same scene, except that this time we will know what the women are discussing and what has lead them to this moment. It’s a terrific film.